This section shows press releases and images when they are available to the public. Press Contact: Amy Hartmel, Media Coordinator. Howland Island, Pacific Ocean. 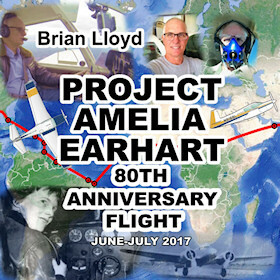 July 24, 2017 – Pilot Brian Lloyd is flying over Howland Island today on his round-the-world effort to retrace the famous Amelia Earhart route from 1937. It has been eighty years since Earhart and her navigator Fred Noonan tried unsuccessfully to land on this tiny atoll in the middle of the Pacific Ocean. In a tribute to the bygone flyers, Lloyd drops two large flowers out of his window. He is piloting a small single-engine Mooney propeller driven aircraft, named Spirit. 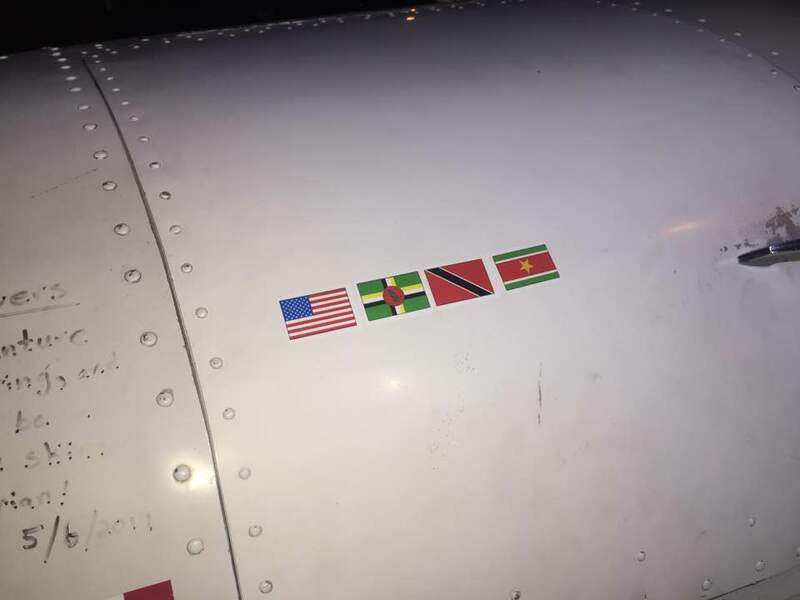 Since starting out on June 1st, the flight has traversed dozens of countries while circumnavigating the globe at the equator. Brian Lloyd is the first solo aviator to attempt the Earhart route, stopping at the same airstrips where the original flight landed, some of which are now huge international airports. Spirit has endured fierce winds, blasting sandstorms, and severe tropical weather along the equator. It has not been an easy flight, due to the long flight hours and complex logistics. On July 14th, Spirit’s engine failed at 21,000 feet over the ocean, forcing it to land for repairs. 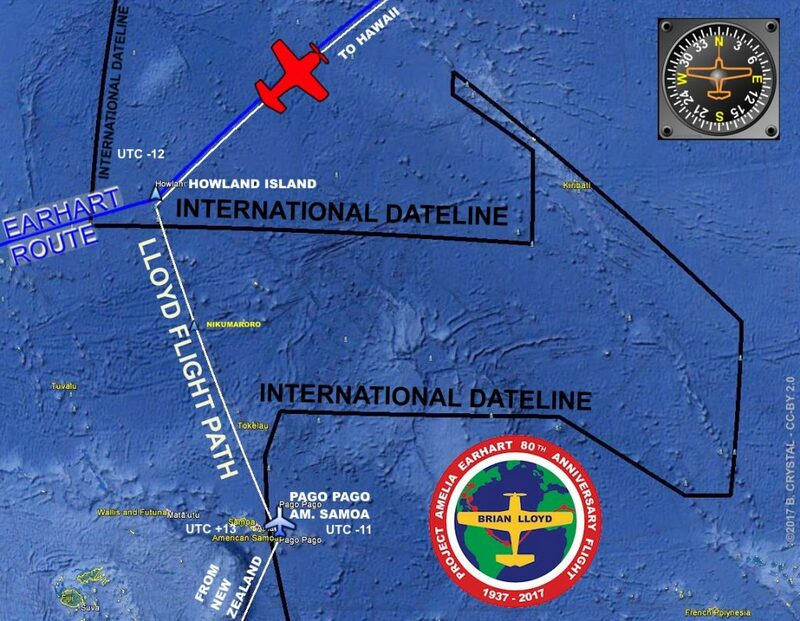 Today’s flight continues onward over the ocean to complete the route Earhart and Noonan would have made, if only they had found their landing strip on Howland Island in July 1937 as planned. 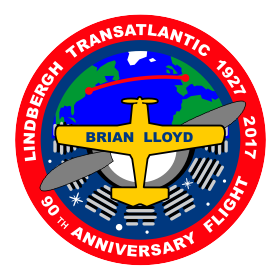 Brian Lloyd will stop in Hawaii and Oakland, California, then land at the Amelia Earhart Museum in Atchison, Kansas. From there, he will fly to his home airfield in Texas, to fulfill this epic journey around the world. 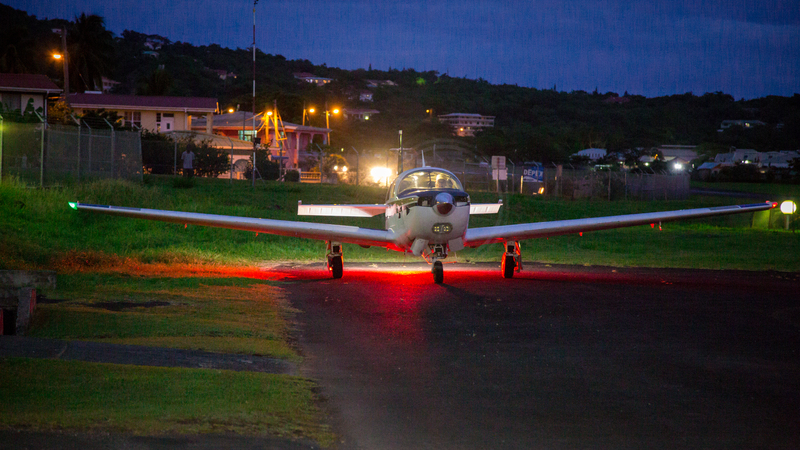 Brian Lloyd’s aircraft, a Mooney M20K 231 with tail number N916BL, is outfitted with expanded fuel capacity and modern satellite avionics gear, giving it a 3000 mile range. But, like the Earhart’s famous Lockheed Electra plane, there is a High Frequency (HF) radio in Spirit. 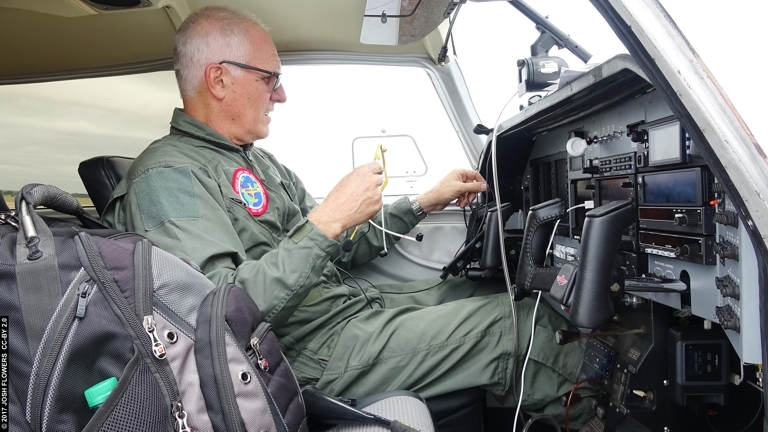 Brian Lloyd uses the HF radio to communicate with hundreds of ham radio operators all over the world while he is in flight, using the callsign “WB6RQN Aeronautical Mobile”. Miami, Florida, USA, June 1, 2017 – As pilot Brian Lloyd propels his single-engine plane named “Spirit” into the sky on a solo round-the-world adventure, he commemorates Amelia Earhart’s famous flight eighty years ago on this date in 1937. The two month flight will follow Earhart’s historic route to circumnavigate the world at the equator, which starts in Miami, skirts South America, crosses the Atlantic, then Africa, and onward around the world. “My father taught me to fly when I was 14 years old. Aviation is in my family, both of my sons are pilots.” Mr. Lloyd said. He is actively communicating while in the air. The public can track his flight on the web, social media, as well as Ham radio. “I’ve been a ham radio operator since 1976 and enjoy radio communications very much. The flight route has some very long legs, so I will have plenty of opportunities to talk with ham operators while flying over the world’s oceans,” Brian said. Commercial airliners fly long distances every day, but non-stop ocean flights are quite difficult for small propeller planes, which have limited range. 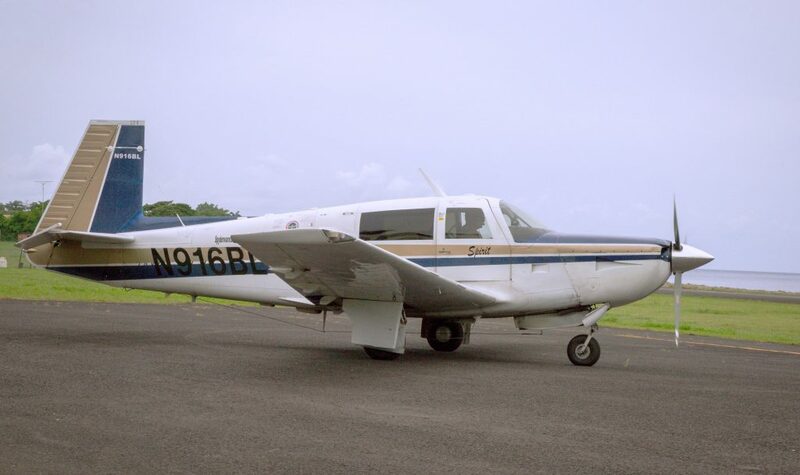 To make it possible, Brian Lloyd modified his 1979 Mooney airplane to carry 150 gallons more fuel, then equipped it with modern navigation equipment, long range radio, and satellite communications. Still, the flight is not without risk, and special safety gear must be taken along. The public can track his flight on the web, social media, as well as Ham radio. 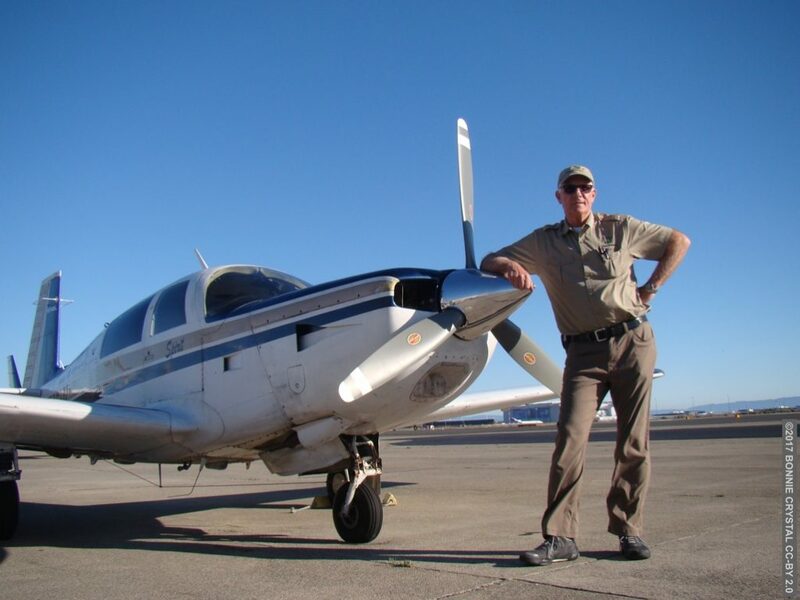 About: Brian Lloyd, 62, is a pilot, flight instructor, engineer, educator, and radio operator. He lives near San Antonio, Texas, USA. The commemorative flights are co-sponsored by The Classic Aircraft Aviation Museum, a non-profit in Texas, and many other individuals who contribute to supporting the flights through donations. Miami, Florida, USA, June 1, 2017 – As pilot Brian Lloyd propels his single-engine plane named “Spirit” into the sky on a solo round-the-world adventure, he commemorates Amelia Earhart’s famous flight eighty years ago on this date in 1937. He is communicating live via radio with Ham operators while flying. The two month flight will follow Earhart’s historic route to circumnavigate the world at the equator, which starts in Miami, skirts the chain of Caribbean islands, then along the coast of South America, crosses the Atlantic eastward, and then onward around the world. “I’ve been a ham radio operator since 1976 and enjoy radio communications very much. 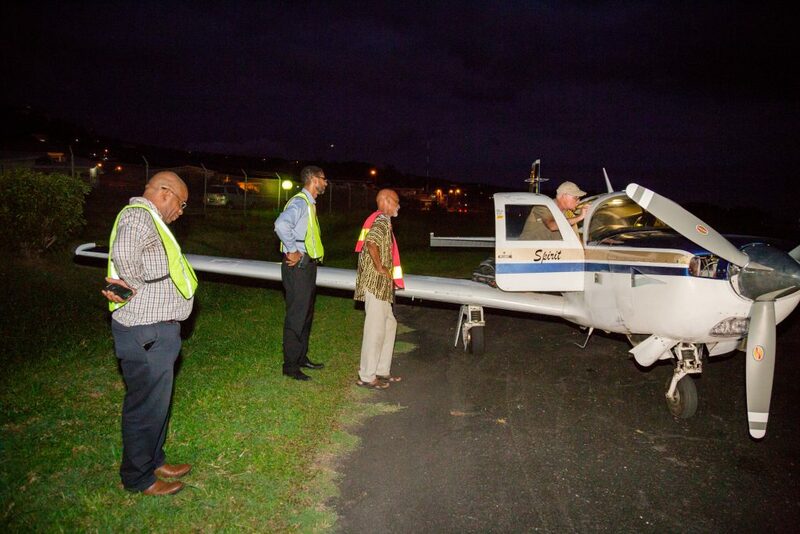 The plane is set up with HF radio for aeronautical purposes with the normal pilot headset controls. 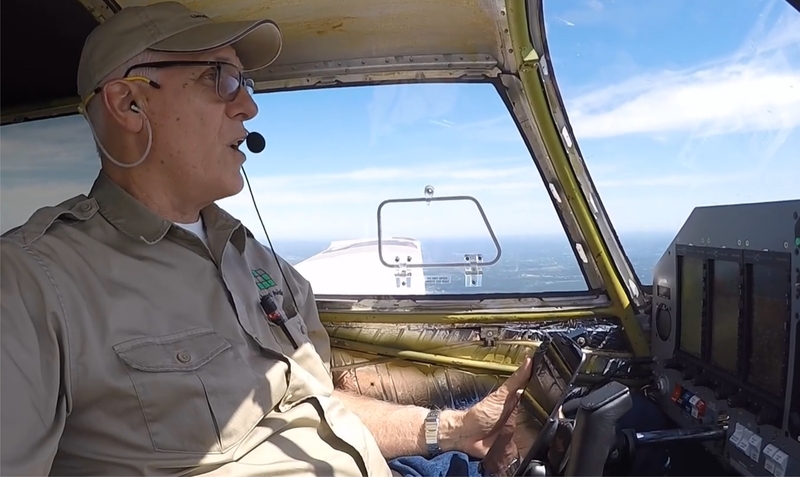 The flight route has some very long legs, so I will have plenty of opportunities during June and July to talk with ham operators while flying over the world’s oceans,” Brian said. Update May 22 – Unfavorable winds and weather on the Atlantic route combined with airplane equipment problems forced the New York to Paris speed flight to be postponed until after the Round-The-World flight. There was only a short window of time that the flight could have happened, and the window has now closed. Mr. Lloyd will fly back to Texas for repairs as soon as the storm clears in Long Island, New York. 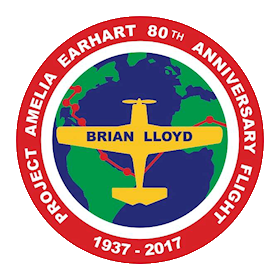 Brian Lloyd is scheduled to take off from Miami on the Amelia Earhart 80th Anniversary round-the-world flight on June 1st. A new press release will be uploaded soon. 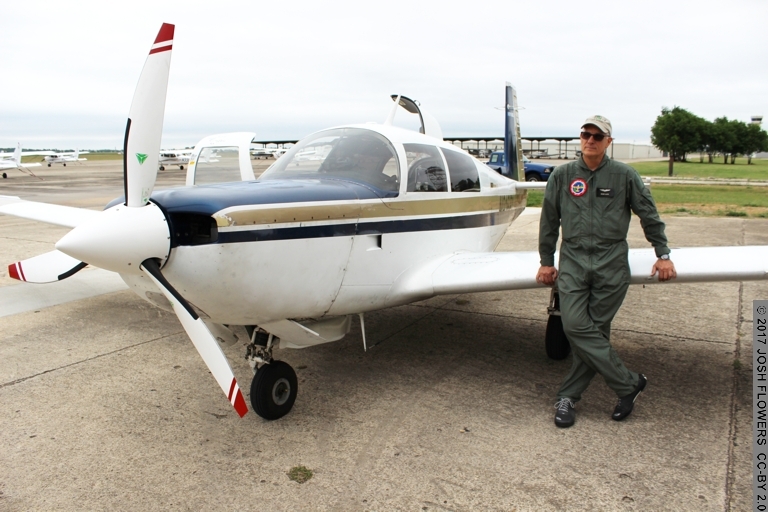 Brian Lloyd prior to flight of airplane Spirit 21 MAY 2017 in Texas USA. Click for higher resolution. 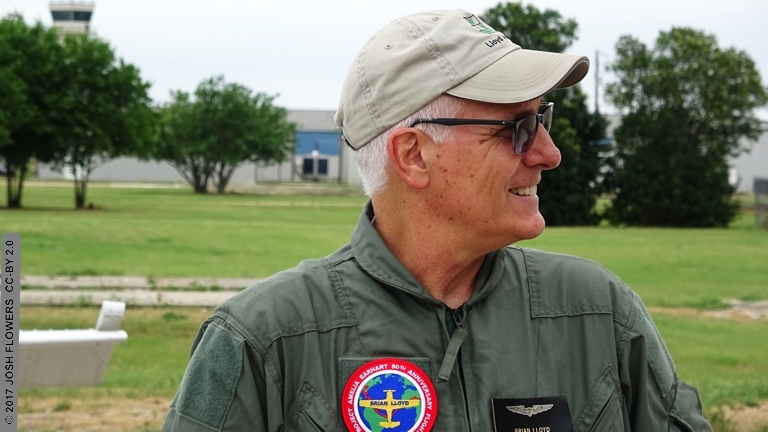 Brian Lloyd pauses prior to flight of airplane Spirit 21 MAY 2017 in Texas USA. Click for higher resolution. 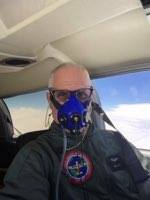 Brian Lloyd prepares for flight of airplane Spirit 21 MAY 2017 in Texas USA. Click for higher resolution. Brian Lloyd flies his airplane Spirit during a test flight above Texas, USA. May 2017. Credit: Josh Flowers. CC-BY. 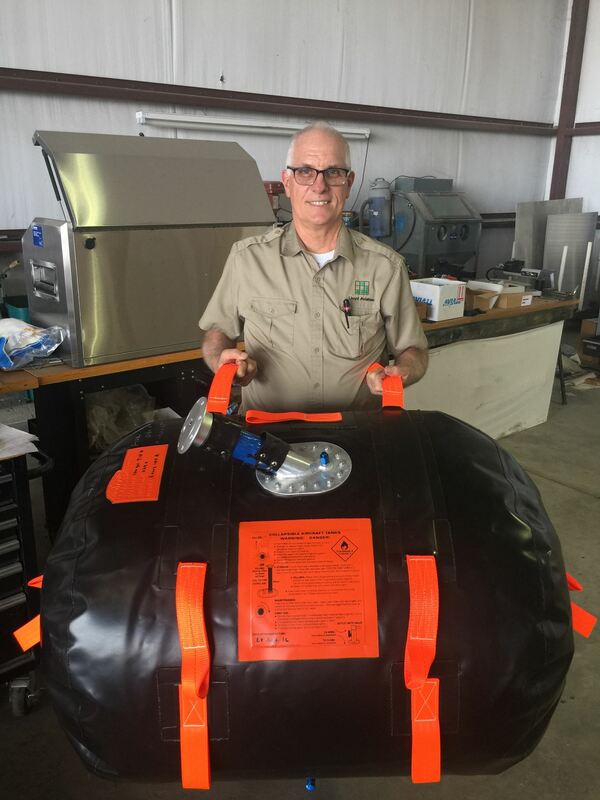 Brian Lloyd holds the 100 gallon extra fuel tank during its installation into the airplane Spirit. May 2017. Credit: Brian Lloyd. CC-BY. Recently completed upgrades to the airplane Spirit includes improved avionics shown in this photo. May 2017. Brian Lloyd. CC-BY. The previous New York to Paris speed record for this type of aircraft was set in 1983 in a Beechcraft Bonanza.